Home / Unlabelled / Aliyu, Mimiko, Fayose, others shun meeting with Jonathan. Aliyu, Mimiko, Fayose, others shun meeting with Jonathan. GOVERNORS Aliyu Babangida (Niger), Olusegun Mimiko (Ondo), Sule Lamido (Jigawa), Ibrahim Shema (Katsina) and Ayodele Fayose (Ekiti) yesterday shunned a meeting of the Peoples Democratic Party (PDP) Governors’ Forum with President Goodluck Jonathan. of the PDP governors could not make it to the meeting because the notice was short. 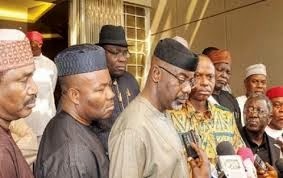 Among the PDP governors who met with Jonathan were Theodore Orji (Abia); Seriake Dickson (Bayelsa) and Liyel Imoke (Cross River). Idris Wada (Kogi); Emmanuel Uduaghan (Delta); Martin Elechi (Ebonyi); Ibrahim Dankwambo (Gombe); Murktar Yero (Kaduna); Jonah Jang (Plateau); and Sullivan Chime (Enugu) attended the meeting. Speaking with State House correspondents after meeting, Akpabio maintained that the party will not lose any of its states during April 11 governorship elections. The party lost the presidential election last Saturday to the All Progressives Congress (APC). Akpabio praised Jonathan for sacrificing his political ambition for the sake of Nigeria. According to him, Jonathan has set a statesmanly record in Africa by conceding victory to the opposition despite alleged flaws in the election. He reiterated the party’s position that it would explore possible legal options in seeking redress over the anomalies observed during the election. Akpabio also said the PDP was glad to have piloted the affairs of the country for the past 16 years and giving Nigeria a very peaceful transition that had shocked all and sundry. The governor also dismissed reports that the PDP National Chairman, Adamu Muazu, had resigned his appointment. He said that he spoke with Muazu 30 minutes earlier and nothing of such had happened.